LOCATED ON THE Shannon Estuary, Beeves Rock Lighthouse has been described as “bizarre” not only for its architecture but for the story of its most famous keeper. In the early 20th Century the maternal grandfather of former Taoiseach Enda Kenny served as its keeper. As it was only accessible by boat it made intimacy hard for newly married James McGinley and his wife, Margaret Heekin. Margaret lived in the Commissioners of Irish Lights’ cottage on the mainland near Askeaton, Co Limerick, while her husband was stationed on the rock. Daily communication between the couple was only possible via semaphore. “They would wave flags at each other. It was the early 20th-century version of texting, and that’s how they communicated until he had shore leave, so that was certainly not a romantic start to the marriage,” author and illustrator Roger O’Reilly told TheJournal.ie. The history of Beeves Rock is highlighted along with 80 other lighthouses in O’Reilly’s new book, Lighthouses of Ireland. The book has been nominated for an Irish Book Award in TheJournal.ie sponsored category Best Irish Published Book of the Year. The Drogheda artist launched his own illustration business in 2016, designing retro posters of Irish towns in the style of old railway posters. Over a two-year period, he travelled across the country capturing images of lighthouses for his new book which details the histories of the lighthouses around our shores, estuaries and harbours. According to O’Reilly, the success of Beeves Rock Lighthouse can be measured by the fact that few vessels have sunk in the stretch of river since it was built. But one of the few wreckages in the estuary was a Dutch aircraft, carrying diamonds, which crashed with its cargo in 1957. The lighthouse itself is basically a house with a lighthouse coming up through the roof, said O’Reilly. Isolation like that experienced by McGinley was common among the keepers of lighthouses in inaccessible places. In the winter of 1942/43 a winter storm trapped the keepers of Blackrock lighthouse in Co Mayo on the island for 117 days. “They didn’t have a well, so they would basically take water from the roof,” O’Reilly said. When there was a lull in the weather in February 1943, John Padden, the contract boatman who had managed to get some rations across to the keepers during the storm, was able to finally relieve them except for one, Jack Scott, who stayed behind to direct operations until conditions returned to normal. In more recent years the site has come back to prominence after the coast guard helicopter Rescue 116 crashed into Blackrock, tragically killing all four crew members. In March 2017, Captain Dara Fitzpatrick, Captain Mark Duffy, winchman Ciarán Smith and winch operator Paul Ormsby all lost their lives while providing top cover support on a medical evacuation. Speaking to TheJournal.ie, O’Reilly said he never had any intention of compiling a comprehensive collection of Ireland’s lighthouses. For him, it started off when it was coming up to Christmas and he wanted to give people an extra gift when they ordered an illustration of his. 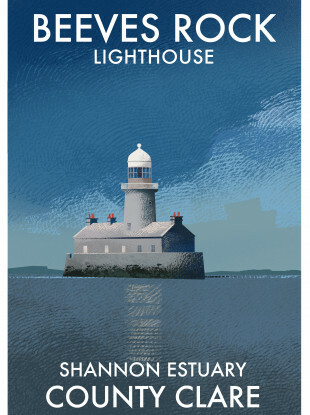 O’Reilly designed two mini-posters of lighthouses for customers – Fastnet in Co Cork and the Bailey in Co Dublin – which planted the seed for an idea that would come to fruition in the spring of 2016. “From that, I guess the thing took legs – before I knew it I was halfway up the east coast and then up around the Mayo area. “By that stage, I decided there’s no point in stopping, I may as well keep going until I have them all done,” O’Reilly said. O’Reilly said that because the images are digital, he wanted to keep something of himself in them, so he included his fingerprint in each one. I scanned my fingerprint and used that as part of the texture within the pictures. That was a way of keeping a personal touch. Since the final lighthouse was automated in 1997 – the Bailey in Howth – all the work of keeping Ireland’s lighthouses functioning is done remotely. But despite advancing technology, lighthouses still serve as crucial navigational aids for the maritime traffic around Ireland. O’Reilly’s book, Lighthouses of Ireland – An Illustrated Guide to the Sentinels that Guard our Coastline – has been nominated for the An Post Irish Book Award in TheJournal.ie sponsored category Best Irish Published Book of the Year. Email “Enda Kenny's grandfather, a Dutch plane full of diamonds: Illustrating the lesser-known histories of Irish lighthouses”. Feedback on “Enda Kenny's grandfather, a Dutch plane full of diamonds: Illustrating the lesser-known histories of Irish lighthouses”.